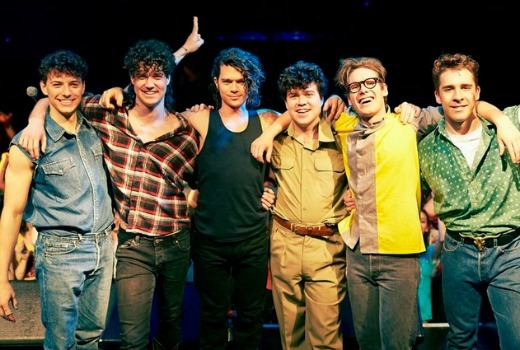 INXS a ratings sensation, as Seven thumps Schapelle telemovie. Seven’s miniseries scored an excellent 1.97m viewers last night, well in front of Nine’s Schapelle telemovie on 1.02m viewers. While INXS managed #1 ranking for the night, Schapelle had to settle for #7, outrated by other titles including Sunday Night, Seven and Nine News and The Block. Seven won the night with a 37.6% share over Nine’s 27.0%. TEN was 20.5%, ABC 11.9% and SBS 3.1%. The ratings battle left others in its wake. ABC drama Rake was pushed down to 645,000 viewers. TEN’s rebooted Reality series So You Think You Can Dance Australia was rejected at just 466,000 viewers, thrashed by My Kitchen Rules (1.64m) and The Block (1.27m). But TEN did have better fortunes with its Sochi coverage. Seven scored with Sunday Night (1.8m), Seven News (1.29m) and Tricked (433,000). Nine News was 1.22m for Nine then 60 Minutes (866,000) and Bali: The Dark Side of Paradise (600,000). A single Winter Olympics event, the Women’s Snowboard Slopefest final, pulled 996,000. TEN Eyewitness News was 587,000. Other Sochi coverage was 454,000 for evening and 440,000 for afternoon. ABC News (790,000) was best for ABC1 then David Attenborough: Rise of the Animals (752,000). On SBS ONE it was World News Australia (202,000) and Archeology: A Secret History (200,000). Much of ONE’s Sochi coverage eclipsed the audience on TEN with early evening (494,000) and afternoon (492,000). The channel did well at a 7.2% share. Well, after all the that hard graft, effort and money that Ten put into it, I do hope SYTYCD gets its budget back (but I doubt it)! “They were as squeaky clean as The Seekers…” *LOL* Matt F, may I suggest you seek professional help on this matter! I must say, The Seekers were much cleaner and more family-values oriented. Now may I suggest you seek counselling through the psychology faculty of Avondale. May you pay the price Nien. I missed the News at 7pm so I watched ABC News 24 later on instead. I thank the ABC very much for this news service especially when it is covering the news. I used to also love the repeats of Lateline but unfortunately I have a phobia against the computer graphic they use. I wish it wasn’t there because it is a high stress response. I’ve tried to have a different reaction. It isn’t working. I was interested to see the ratings for Sunday. I’ll just admit I don’t envy any of the programmers their job. Because what a stressful experience it must be. One that is constant. So congratulations and commiserations. So… The least popular kid in the class decided to hold a birthday party at the same time as the school sports star. Result predictable. For the bumbling Colonel Klinks at Nein they got their just dessert. The joint would be better off being run by somebody who knows nothing about the industry…. Thankfully this could still be an internal appointment. INXS was ok. Was sometimes hard to follow the plot at times but it flowed better towards the end so hopefully it will be better next week. Devastated to see this result for So You Think You Can Dance. This is an expensive show with what I believe are the industry’s highest standards. <500K for season premiere is not a good sign though I remain confident it can pick up. Then again it was a night when the story of the hour (Schapelle's) saw that show with only 1M. Networks only have themselves to blame for that one for the last minute programming decisions. Nine gambled and lost. Sincerely hope SYTYCD picks up. It's worth a lot more viewers in my opinion. SYTYCD should have been a Wed & Thu show. those SYTYCD ratings are hilarious and 400k too much. There’s a reason that tired show was axed in the first place. And to think that Ten, Beverly et al were considering bringing back Idol too. They need a reality check or be shown the door. Did anyone else see the little dig 7 had at 9 yesterday afternoon when they were repeating MKR. They said while we were reporting Schapelle was successful getting parole ACA were busy telling you about a shonky tradesman. Didn’t watch SYTYCD. I wasn’t sold after all those bland promos they ran. The original SYTYCD Aus at least had a diverse panel of judges, but from what I gathered this reboot consists of 3 blokes in suits and Paula Abdul as the token American – you know… the one that people have actually heard of. @andrewb: a great idea moving SYTYCDA to Fri & Sat nights. It’s a great early evening show for families, teenage girls, anyone who likes dance and those ‘heading out on the town’. (We used to watch ‘Man ‘o Man’ many, many moons ago before we headed into town!). There is no competition in this time slot so it could work. I’ve been looking forward to its return & would get disappointed if it gets moved to 11. The money it costs wouldn’t really be returned on those nights. I think all the criticism of Nine is unfair. If they had of shown it tonight (first run) it would of got lost in all the Corby’s specials tonight. They seemed to have panicked a bit and probably should of waited a week to show it by they were caught up in the circumstances. I watched INXS and thought it was great TV. It was always going to win the battle as it has been marketed on 7 for months and everyone had been waiting for it. Maybe time TEN tries to offer programming on Friday and Saturday nights other than repeats and movies. I believe SYTYCDA would do OK on Friday and Saturday night where it doesn’t have MKR and The Block against it (well other than “encores!”). With lower viewer numbers on weekends, TEN shares for those nights could increase and SYTYCDA could actually do OK. I do believe overall it is time for networks to put more consideration into what they program on Friday and Saturday nights. Many of us actually do watch TV those nights – and we’re not all over 55! From what I’ve seen some of those that go out don’t go out till later in the night anyway. I know we used to never be out before 9.30pm on weekends! @Lizzie May, totally agree! Fremantle is inept in the drama department. Critics claiming how good Wentworth is, is just embarrassing!